I AM A GIANT CHICKEN, SO WHAT?! What are you looking at? Oh, I’m sorry, are you not used to seeing a chicken this size? This is me. Get used to it. GO ahead. STARE AT MY MARVELOUS BODY! I take up space. Yes! It’s REAL! Yes! Call me a Monster! Yes! I love it! YES! I bask in it! In fact, I laugh at your superficial observations. By now, your words can’t hurt me. I am a Brahma chicken. Bred in America. My name derives from the Brahmaputra River in India. I am proud. But let me guess. I look I’m wearing white jogging pants with Uggs and a fur coat? I look like a chicken wearing a large chicken costume? Climbing out of my pen, do I look like Shaq stepping out of a Volkswagen Beetle? Maybe. Funny. Not so funny when you hear that I’m rare and endangered, though. Your hurtful words roll off my back like something rolling off a giant chicken’s back. Look at me. LOOK AT ME!!! Extra, extra! Read all about me! It’s okay, I want you to fear me. Watch me stomp the yard with my brolic body. 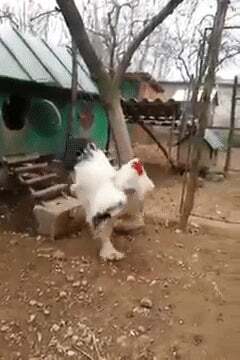 Watch me cluck. Watch me conquer every space. Watch me hypnotize you with my wide gait. I cannot be contained.